Page 2 offers congratulations to the St. Louis Cardinals, who defeated the Texas Rangers in one of the most exciting World Series in years. Roy Halladay, Cliff Lee and Cole Hamels become the first trio of teammates to win 20 games each since 1973 and the triumvirate of Ryan Howard, Chase Utley and Hunter Pence each top the 30-home run plateau as the Phillies coast to a franchise-record 106 wins. Still, it's the signing of fourth outfielder Manny Ramirez, fresh off a 100-game suspension for violating MLB's drug policy, that ultimately proves pivotal. With his biological clock ticking -- but no longer able to take fertility supplements -- Ramirez belts the winning home run in Game 6 to deliver a final championship for his legacy before menopause. Philadelphia manager Charlie Manuel announces his retirement during the postgame news conference, but no one among the Phillies or the assembled media is able to understand Manuel through his thick Appalachian drawl. Faced with no alternative, Manuel returns to manage the team for four more seasons. Former Phillies star Darren Daulton, awaiting the conclusion of the Mayan calendar, sends a congratulatory text message to the team from an underground encampment in an undisclosed Florida location. Albert Pujols, in the second season of a 10-year, $365 million contract, enjoys a career year with 59 homers and 155 RBIs and carries the Cubs to their first Fall Classic appearance in 68 years. However, after three consecutive postseason disappointments, it's Texas that rewards the loyalty of its fans with a championship. Adrian Beltre, Nelson Cruz and Josh Hamilton power a balanced Texas offense, but resurgent pitchers A.J. Burnett and John Lackey share World Series MVP honors after throwing two shutouts each. Detroit wins the AL Central for the third time in four seasons and finally breaks through to win its first World Series in 30 years. After falling behind three games to two, the Tigers return home to win Game 6 on an unlikely steal of home by Miguel Cabrera. Then Justin Verlander throws a no-hitter with 11 strikeouts in Game 7, extending the Cubs' championship drought to 106 years. Victor Martinez hits four homers and steals six bases to earn MVP honors. At the victory parade, Detroit manager Jim Leyland smokes two victory cigars simultaneously and chases them with a quart of chocolate milk. CC Sabathia wins twice. Alex Rodriguez delivers two game-winning hits. Jesus Montero hits four homers. Curtis Granderson steals five bases. ... Mark Teixeira strands 19 baserunners. After losing the first two games of the series, Yankees manager Joe Girardi burns his massive notebook binder and resolves to manage on gut reaction. The Yankees go on to win four in a row to capture the franchise's 28th world championship. Cubs shortstop Derek Jeter goes 13-for-22 and plays flawless defense, and Chicago ace Joba Chamberlain throws a no-hitter in Game 1 in a losing effort. Unable to garner enough support for a new ballpark in Tampa Bay, the Rays uproot from Florida for the promise of a state-of-the-art facility in the Beehive State. The team is able to retain its core of Evan Longoria, B.J. Upton, Matt Joyce, David Price and Matt Moore. But it's 40-40 man Desmond Jennings who steals the show in the Fall Classic, batting .500 with three home runs and six stolen bases. The Cubs, winners of 103 games in the regular season, hit just .195 in the Fall Classic to become MLB's Buffalo Bills with four consecutive World Series losses. The A's finally give up on plans to build a proposed stadium in the East Bay and move into a retrofitted Raley Field with plans to build a new 39,000-seat venue in California's capital. The Cubs are similarly preparing to move into a new suburban stadium in 2018, setting the stage for a historic Game 7 in Wrigleyville. Gio Gonzalez outduels Matt Garza as the A's win 1-0 on a Kurt Suzuki homer, and angry Cubs fans riot and loot Wrigley Field for souvenirs after the last game played at the venerable venue. Chicago's president of baseball operations, Theo Epstein, resigns amid fan outrage and sneaks out of Wrigley in a goat costume to avoid reporters. Stephen Strasburg, Prince Fielder and Bryce Harper enjoy terrific postseason performances to lift the Nationals to their first championship. Strasburg captures World Series MVP honors, winning three games, including a Game 7 shutout. Despite the benefit of two dominant wins by Felix Hernandez, the Mariners are left to regret not tanking the final three games of the 2008 season -- and thus losing out on the subsequent No. 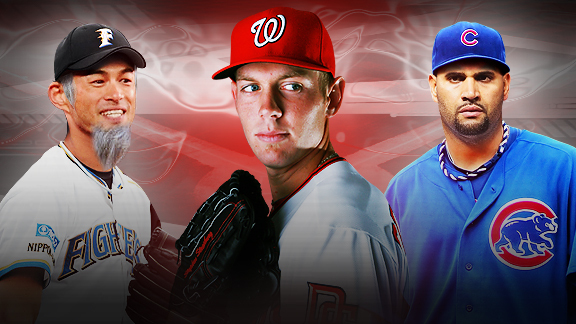 1 draft pick, Strasburg, to Washington. A year after finishing last in the NL East, the Marlins rebound, and captain Hanley Ramirez delivers Miami the championship that LeBron James never did. Ozzie Guillen quits and returns as Marlins manager seven times via Twitter over the course of the season, breaking the previous record of six by Mets skipper Nick Swisher. Miami third baseman Alex Rodriguez sets a postseason record with 10 homers, and oft-exiled outfielder Logan Morrison caps the sweep with a decisive grand slam. In a series matching a former AL team representing the NL against a former NL team representing the AL, the Brewers ride the consistency of veterans Ryan Braun and Zack Greinke to capture the first World Series title in franchise history and the first for the city of Milwaukee in 63 years. A pivotal acquisition comes at the trade deadline when Milwaukee gets Prince Fielder from Washington and signs him to a contract extension through 2023, contingent upon the Brewers agreeing to add a veggie dog to the Miller Park Sausage Race competition. The governor of Wisconsin, Aaron Rodgers, joins Bernie Brewer by sliding into a giant mug of beer at the victory parade. After a memorable season in which he eclipsed career milestones of 200 wins and 3,000 strikeouts, Felix Hernandez turns in a dominant postseason with five wins and three shutouts. Alex Liddi hits a three-run, walk-off homer to win the clinching Game 5, delivering the first championship to Seattle since the Sonics won the NBA title 42 years earlier. Moments after the final notes of "We Are the Champions" ring through Safeco Field, Seattle fans lustily chant "@&%# Clay Bennett" in homage to the Oklahoma City Thunder owner. Albert Pujols returns to St. Louis on a one-year, incentive-laden contract at age 42, following a tumultuous decade with the Cubs in which he was heavily criticized for failing to bring a championship to Twitter Ballpark at New Wrigley Field. He enjoys a solid season -- .270, 15 homers, 65 RBIs -- and rekindles old magic in the Fall Classic with three homers and eight RBIs. After being named World Series MVP, Pujols reveals his true age to be 59 and retires to his private Caribbean island a champion. Wily veteran Jered Weaver outshines counterpart Stephen Strasburg, allowing just five hits and one earned run in two victories. In celebration, Angels owner Arte Moreno treats 45,000-plus giddy fans at the Big A to complementary Dippin' Dots, which remain the ice cream of the future -- even 12 years from now. Following the series, the Rally Monkey retires after two decades of faithful service to the Angels to spend more time with his troop.